The McQuaig 360 Leadership Review is revolutionary. It asks peers, managers and direct reports to review their leader, not score them. It creates a concise report that drives action. 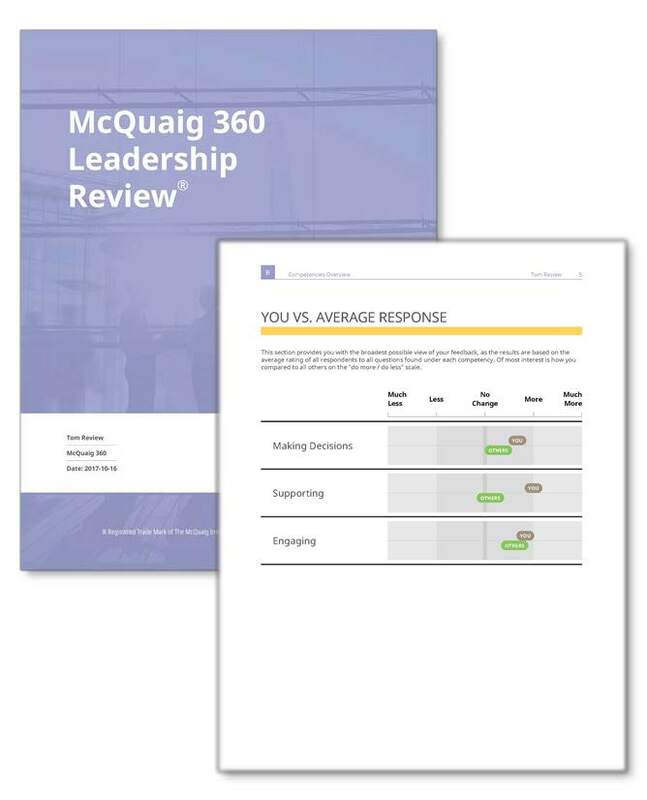 The McQuaig 360 Leadership Review is one of the most streamlined 360 assessments and takes 12 minutes to complete, with comments. It celebrates what your leader is doing well. It balances this with the feedback and actions they need to develop and move forward. How would you like your leader to change? Our 360 focuses on what leaders should do more, less or the same of to grow. Why is the McQuaig 360 Leadership Review different? This 360 assessment draws on eight leadership competencies. These competencies are considered the gold standard in leadership and offer a framework to develop your people. A deeper insight of your leader’s development is gained when the McQuaig 360 is linked to the McQuaig Word Survey®. – Toni Pierce. American Spiralweld. Making Decisions Do they make good decisions and bring others along? Supporting Are they people focused? Do they understand what is right in a leadership context? Engaging Can they build connections? Are they able to influence others and sell ideas? Interpreting Can they draw on their expertise and experience? Are they able to get to the core of the problem? Conceptualising Can they create new solutions? Can they demonstrate broad perspectives and consider longer time frames? Execution Are they strong planners? Are they results oriented? Change Orientation Can they cope with change? Do they recover from setbacks and maintain a positive mindset? Performing Are they goal oriented? Do they show the spirit of an entrepreneur? Feedback only comes from people who have worked with the leader for at least 6 months. Use only for personal and professional development. Never as a tool for discipline. Results are confidential and belong to the leader. It is for them to share. There is no right or wrong. It is a snapshot in time. Choose who provides the 360 feedback. At least one from each group: superior/manager, peers, direct reports. How does the McQuaig 360 Leadership Review link with other McQuaig tools? This 360 assessment can link directly to the McQuaig Word Survey®. Traits from the McQuaig Word Survey® often explain why a leader might receive certain feedback. Consider using the ‘Interpretation Report’ and ‘Leadership Profile’ in conjunction with your 360 feedback session. The McQuaig Self Development Survey™ offers additional insight and suggestions for your leader. We suggest your leader completes the McQuaig Word Survey® before undertaking the McQuaig 360 Leadership Review. Pricing is dependent on usage. Please call 0203 111 9292 for further information. Develop your leaders, call 0203 111 9292.